While the "going out" of the lake ice is one sure signal that spring is on the way, another is the last of the snow piles. This one was photographed on April 26 and it is located, where else, but at the eastern trail head of the Banadad Ski Trail. The Banadad is normally the last ski trail in the state to lose it snow cover. While the Gunflint has not started to "green up" yet, the grasses are turning green and some of the early flowers are beginning to blossom. You know when spring on the Gunflint is near when the ice goes out- Little Ollie Lake when out on April 16 followed by Poplar Lake on April 18th. This marks the second year in a row when Poplar Lake went out on April 18. This is the earliest date I can recall in thirty two years the ice went out this early and those that have been keeping track for even longer can not recall it ever going out earlier then April 18. Wake up George "W" global warming is happening and guess what it is not all due to natural causes. In response to this post the following anonymous entry was received. "George W is not the only one that needs to "wake Up". The warnings for global warming have been sounded for years. We are ALL responsible, not just George W!" I can not agree more; we are all responsible and we all have to do our part. However if real change is going to happen and if global warming is going to be really reduced then those with the power to actually make a difference must get on board. George Bush, as president of the worlds biggest polluting nation, either due to his ineptness or ignorance has yet to seriously take on this issue. It's a glorious Friday April morning at Poplar Creek Guesthouse! Not a cloud in the sky. If you hurry, you can still get in a final sled ride down the hill by Little Ollie Cabin. No guarantees that the snow remnants on the hillside will still be there by late afternoon with the warm weather forecasted. Even in the offseason it's great to be in the woods. Enjoy a hike on a trail as with the woods come alive with the first signs of spring. Birds singing, wildlife scampering and maybe even a cow and calf moose wandering by. Best of all, the mosquitoes are still hitting their snooze alarms for a month or so yet. Life is good on the Gunflint! Granddaughter Janaya (Age 4 1/2) & Grandpa Ted spent a good part of the balmy 40 degree afternoon sledding down the bridge run just outside the inn. According to Janaya, the sledding was "good" and fast sledding conditions were reported. No comment from Ted at this time who is still recovering. -reported by Karla (Inn Keeper-in-training for coverage the last two weeks of April). April 2 - This morning there still is eight to twelve inches of snow in the woods and there is plenty of snow on the Banadad Ski Trail for a spring ski. In fact yesterday several skiers were out and said, "the skiing was great!" The lakes, of course, are still ice bound and on cool mornings great for ski skating. And it is snowing. The snow began this morning and it has continued through most of the day. However, there are some slight signs of spring. 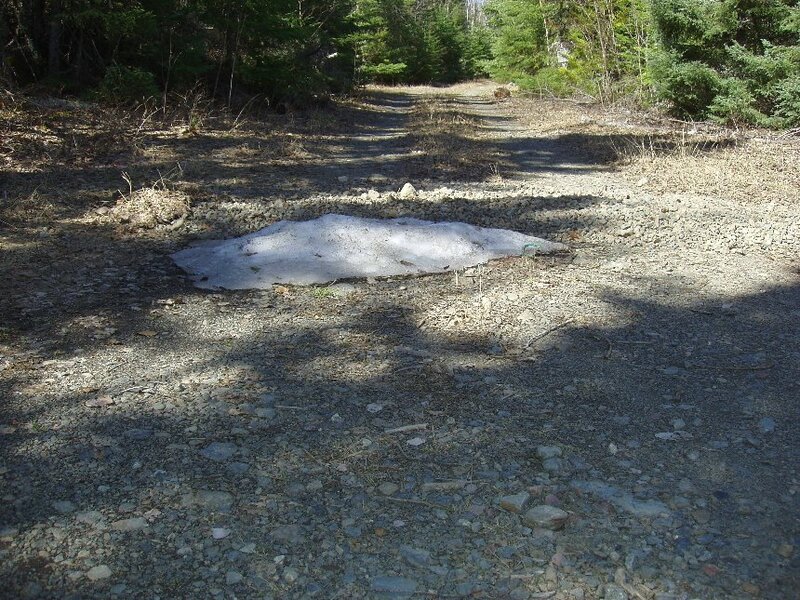 The Lima Grade and the Little Ollie Roads into Little Ollie Lake for the first time since December are now nearly free of snow cover and they have returned to gravel. In a trip to town yesterday we noted that the North and South Brule Rivers are starting to open. The Poplar Creek began to open serveral days ago. At Poplar Creek Guesthouse B&B, the red rubarb "buds" planted with a good southern exposure next to the B&B are starting to poke through the ground- a sure sign of the approaching of Spring. While it will still be serveral weeks for the snow to leave the woods and the lakes to open this is, after all, the Gunflint Trail and it is early April.